Jóhann Gunnarsson stands upright against a white wall. 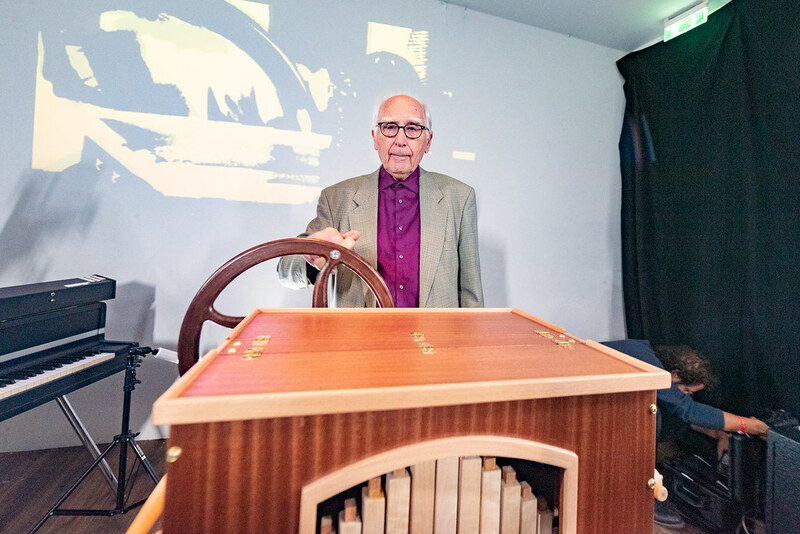 His right-hand turns the wooden wheel of his street organ. His left hand grips the side of the instrument. A twirl of blissful notes flows from the box, effervescently floating in the air in a playful dance of sound. In front of him sits a string quartet, who embellish on the dreamlike music with bowed swells. Behind him, video projections of himself and the quartet distort and mirror themselves on the wall. The music coming from the box isn’t Gunnarsson’s own. Inside the rustic instrument are wires and sophisticated sensors connected to MIDI music files, playing at the rate at which the user turns the wheel. The swooning, graceful notes in question were composed by Gunnarson’s son – the late Icelandic composer and songwriter Jóhann Jóhannsson. In early 2018, the tragic news broke that Jóhannsson died of an accidental drug overdose in his Berlin apartment. He was 48 years old. It was a blow to fans worldwide, across numerous realms of the arts, from music to film and avant-garde devotees. While his music found many ears, there was a special connection to his home of Iceland and the artist community who knew him well. When KEXP ventured to Reykjavik for Iceland Airwaves 2018, we saw this first hand as local artists hosted us at the arts venue Mengi and welcomed us to film their tributes to their friend. But before we get into that, it’s important to know a little bit about Jóhannson and what made his work so significant. The late Jóhannsson was a musical force incapable of being boxed in. A curious mind, always dreaming up of new sounds and means to manipulate them, Jóhannsson was a sonic explorer constantly evolving without losing his refined and delicate prowess. Many of Iceland’s musical exports have pierced the public conscious. Björk, Sigur Rós, Of Monsters and Men, and Ólafur Arnalds have all achieved success and notoriety abroad. Jóhannsson’s presence was quieter or more stealth than his notable peers, but no less significant. There are many ways to encounter Jóhannsson’s work, even when listeners might not have known it was him. Aside from his accomplished work in Icelandic bands like the distorted shoegaze of Daisy Hill Puppy Farm and the renowned electronic group Apparat Organ Quartet, Jóhannsson's prolific catalog includes numerous compositional works and film scores. His music for the Stephen Hawking biopic The Theory of Everything and Sicario earned him Academy Award nominations – the former garnering him a Golden Globe. Other films he worked on include the sci-fi mind-bender Arrival and the psychedelic horror of 2018’s Nicolas Cage thriller Mandy (which was released posthumously). Even trying to frame Jóhannsson’s work by these notable accomplishments doesn’t feel like it shows the true breadth and influence he maintained over his career. His catalog is filled with lush symphonic arrangements and truly progressive experimentations utilizing new musical technologies and concepts. It’s something he came by naturally. His 2006 album IBM 1401, A User’s Manual was inspired by reel-to-reel recordings of an IBM mainframe computer by his father. Gunnarsson himself was one of the first computer programmers in Iceland. 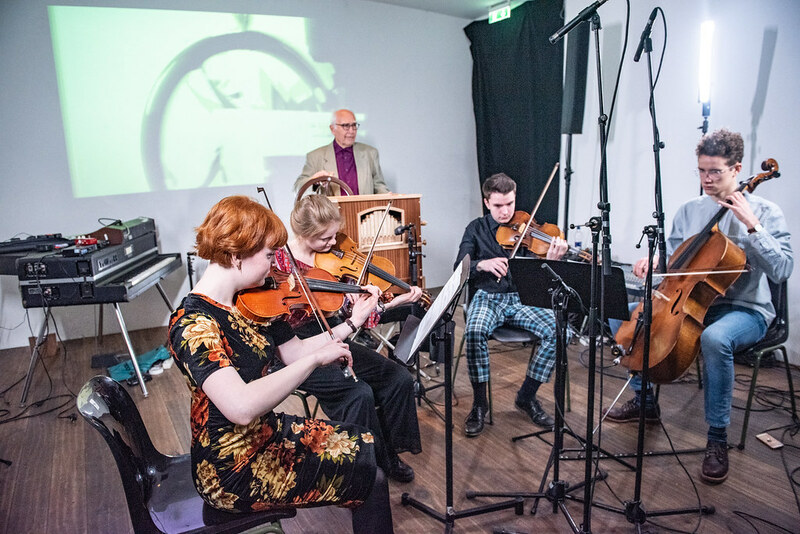 When Jóhannsson performed live on KEXP in 2017 with the American Contemporary Music Ensemble, he was also backed with analog tape loops lined up around the perimeter of the studio. That sentiment is carried out through on-going curation of shows that embrace the abstract and provide room for pure artistic expression. Walking into Mengi is to step into the heart of some of Iceland’s most ambitious creators. Records, books, magazines, and art adorned the walls and shelves of the shop in Mengi’s entrance with a couch area – not unlike a living room – set up in the center of the merchandise. Each LP, CD, and publication is either made by an Icelandic artist or connects back to the country in some way. Behind the couches and chairs, a small set of steps led down to a viewing area facing the performance space in the far back. Though the walls were pale white and the floors were smooth cement, warmth still emanates from the room. A familial spirit resonating, no doubt, from the magic hometown works sold and performed in the space. It’s that warmth from the community that kept the KEXP team warm on the frigid November morning when we arrived at Mengi. Sverrisson, Arnalds, and the whole Mengi crew heartily welcomed the station through their doors as we set up the equipment for a full day’s worth of filming tributes to Jóhannsson. The day began by tracing back to Jóhannsson’s own beginning with a performance from Apparat Organ Quartet. 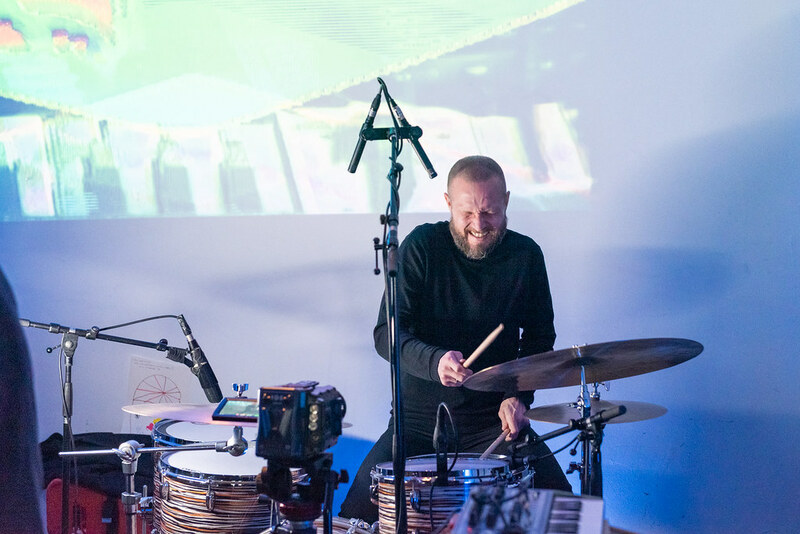 Formed in 1999, Jóhannsson originally saw the band as a collaborative project to perform for his Kitchen Motors concert series. Quickly enough, the band took on a life of its own, releasing two albums and touring across the globe. It’s a musical daydream documented in the band’s own song “123 Forever” – a vibrant, robot-voiced homage to the joy of being in a band, buying a van, and setting out after your dreams. If you’ve ever been in a band or around a band, you’ll be familiar with that intoxicating feeling – the endless expanse of the road, the possibilities lying ahead of you, and the overwhelming joy of creating art you love alongside people you love. 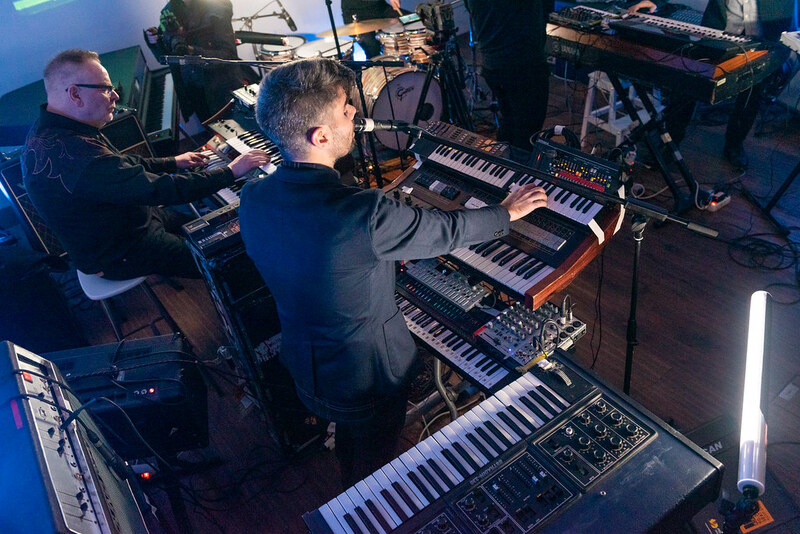 When Apparat Organ Quartet performed the song in Mengi, it took on a different meaning. Dropping down the tempo, the group turned the song into a powerful, mournful drone. The robot voice was left intact, but sounding even more like a lost ghost in the machine than before. The band’s titular organs poignantly prodded along, a respectful dirge that doubled as a memorial march. The emotional resonance of the band’s performance of both “123 Forever” and “Monoprix” was still palpable in the room when Jóhannsson’s father stepped up to the stage with the string quartet, as described earlier. Gunnarsson would play only one song – his son’s theme for the film The Theory of Everything. It was an apt and poignant choice from the composers' numerous and astounding pieces. Even stripped of the context of the film, the theme radiates a sense of wonder and captivating beauty that threaded through much of Jóhannsson’s work. But as I watched Gunnarsson turn the wheel of his organ, I found myself struck by the mere act itself. I thought about the wheel of time constantly turning, moments passing by – seconds turning into minutes, minutes into hours, hours into days and then into years and decades before it suddenly stops. I thought about Gunnarson himself, holding the handle that would play his son’s music and sharing his son’s gifts with the world once more. I thought about how hard it would be to stand there and how dignified and proud Gunnarson looked on the stage in his tan jacket and purple dress shirt. I thought about the people I love. Two of Mengi’s founders, Skúli Sverrisson and Ólöf Arnalds, later made their way to the stage, collaborating on a composition entitled “Saknaðarljóð.” Aside from working at Mengi, Sverrison and Arnalds are accomplished musicians themselves. 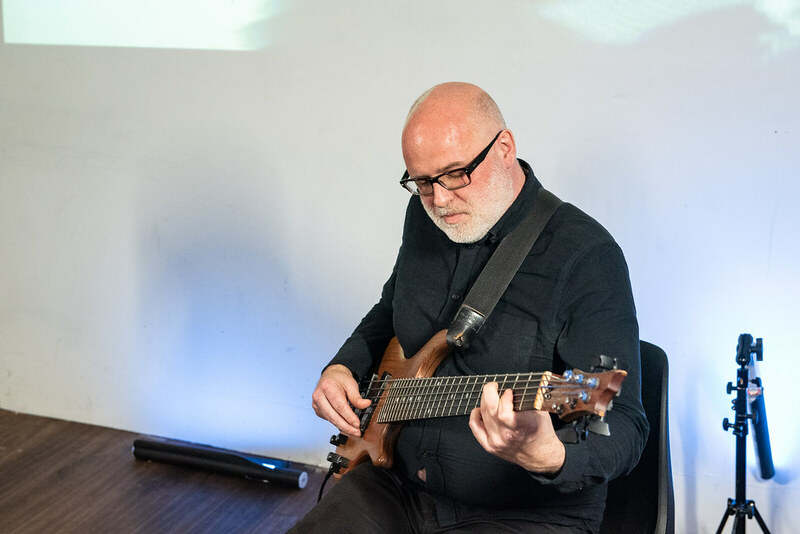 Sverrison’s work as a bassist has seen him collaborate with the likes of Ryuichi Sakamoto, Lou Reed, Blonde Redhead, Laurie Anderson, and of course Jóhannsson. Likewise, Arnalds is also a sought after experimentalist whose work with her group Múm has led to collaborations with notable Icelandic artists like Björk, Mugison, and Stórsveit Nix Noltes. Arnalds’ voice glided over Sverrisson’s rolling bass guitar performance. While her voice ascended toward the heavens, his bass tumbled like raw earth. You could feel the spirit of Jóhannsson’s own work emanating through, a hypnotic blend of airy melody and muscular backing instrumentals with piano accenting the emotional core of the piece. 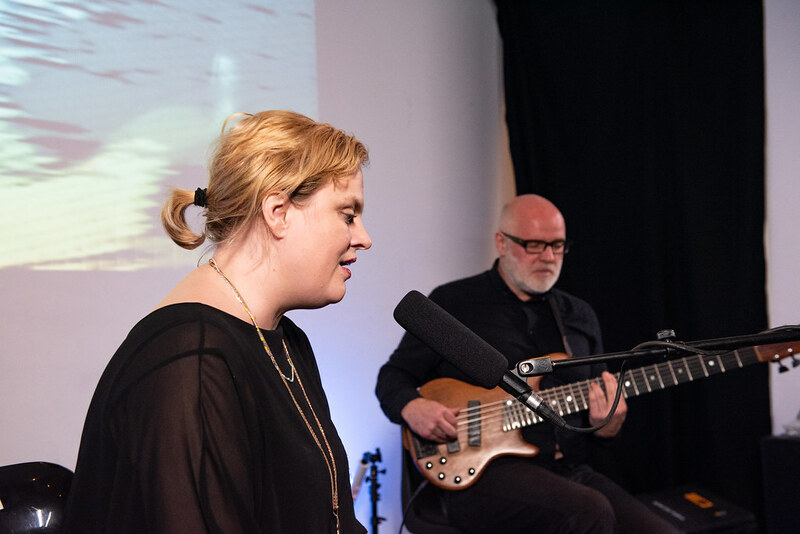 Afterward, Arnalds stepped aside while Sverrison performed a selection from Jóhannsson’s score from the film Mandy – “Mandy Love Theme.” The score for Mandy would ultimately be Jóhannsson’s final work, released posthumously. Sverrison is credited as a player on the album and you can feel his presence on “Mandy Love Theme.” Alone with a pedal board, he methodically and carefully recreated the piece. Tenderly he’d swell the notes, drawing out the affection Jóhannsson embued in his work. A feeling of unending love. By now, the sun had set. The air was getting colder and the sky was a dark glow as Kira Kira prepared for the final performance of the day. Kira Kira is the musical moniker of Kristín Björk Kristjánsdóttir, a composer and producer who co-founded the aforementioned Kitchen Motors collective with Jóhannsson and Hilmar Jensson. Her music feels celestial – or at the very least, like a transmission from Earth that’s found its way back home through the cosmos. There was reverence exuded for every artist that took the Mengi stage, but the quiet of the room was hard to ignore in Kira Kira’s spacious and spellbinding performance. 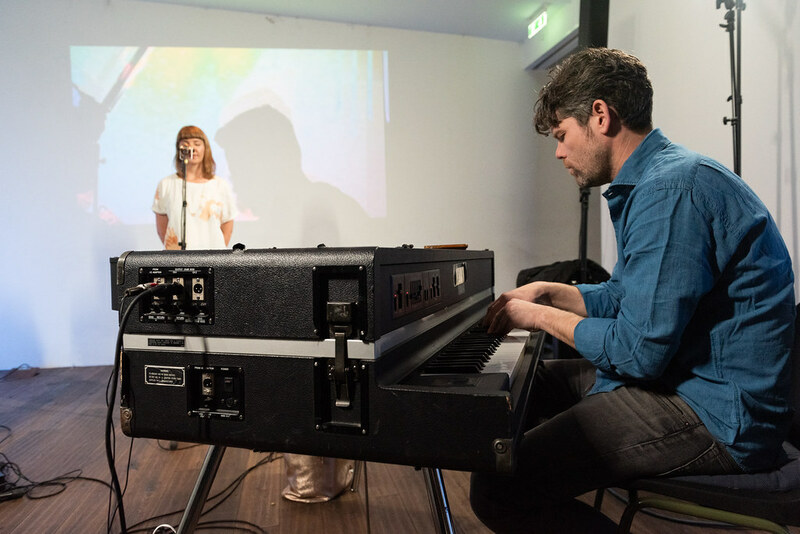 The set began with something of a miracle in the form of a new piece called “A Miracle Is A Shift In Perception From Fear To Love.” The title acts as a mantra, repeated again and again in Kristjánsdóttir's hushed voice cooing over droning, seemingly infinite, instrumentation. The phrase comes from the 1976 book A Course in Miracles, published by The Foundation for Inner Peace. The idea struck Kristjánsdóttir. It became something to aspire to, as she notes in a description on her Bandcamp page: “To consciously, actively transform fear to love by being present with it and singing is such a primal, effective way to do that.” On a day of remembrance, it’s easy to give into fear. Fear of the unknown and what will become of us. But Kira Kira provided an alternative: peace. Peace you could feel in Jóhannsson’s work as well. There was still one more offering of comfort from Kira Kira before we all parted ways with “Talk To Your Hands.” The song, which opens Kira Kira’s 2018 record Alchemy & Friends, was accompanied with only the lightest of instrumentation. A gingerly played trumpet, soft touches of piano keys, and the tapping of a bell on the trumpet’s horn. Much like before, Kristjánsdóttir words in the song were few but lasting. Stillness. The room quietly held the moment and the moments that came before it. You could feel that no one wanted to be the first to move. The whole day illuminated the powerful talent and influence of Jóhannsson’s music, but it was also a chance to see how he had personally affected the lives of artists in his community. The accolades and awards he received in his lifetime were surely deserved, but the real prize was always his music and his spirit. To get to experience the heart of his music once again, in his hometown no less, is a priceless treasure. One that’s a joy to now share with the rest of the world. Our second day at KEX Hostel starts off blissfully with the renowned Icelandic composer. 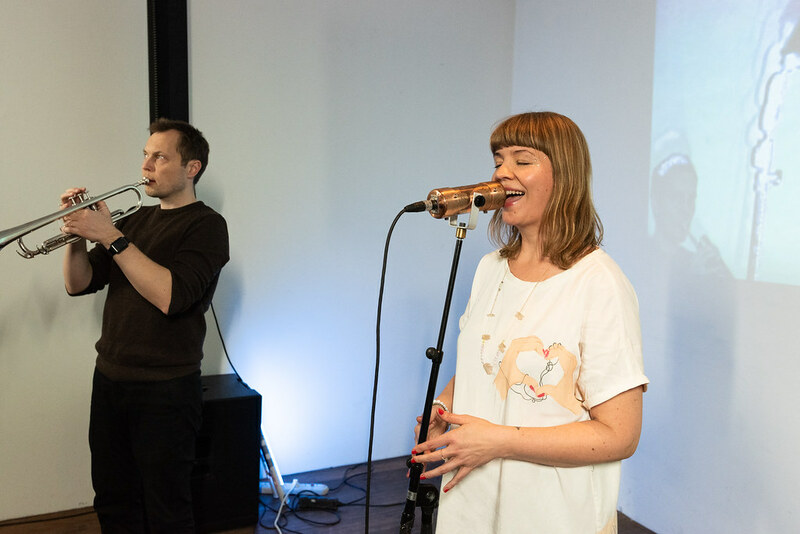 Our second performance of the day here at the KEX Hostel in Reykjavik, Iceland was yet another thrilling debut of a collaboration between two renowned Icelandic composers. A favorite of KEXP, Icelandic artist Jóhann Jóhannsson passed away yesterday, Friday, February 9th, in his Berlin apartment. Cause of death is currently unknown, but authorities are investigating. The award-winning composer was 48-years-old.